"Prototype" is the perfect word to describe the this MDX concept as it doesn't appear to look like any Acura, or really any car, we've ever seen before. From its dramatic use of headlights in the front of the car to the inclusion of LEDs — normally reserved for hi-tech electronics — to the glass enclosed cockpit protecting its passengers from the elements, it is a shockingly sci-fi vision of a world we can barely glimpse. Do we live in 2038 already? Is this Minority Report? Is there a use for a man anymore or is the future led by iron men with circuited brains? 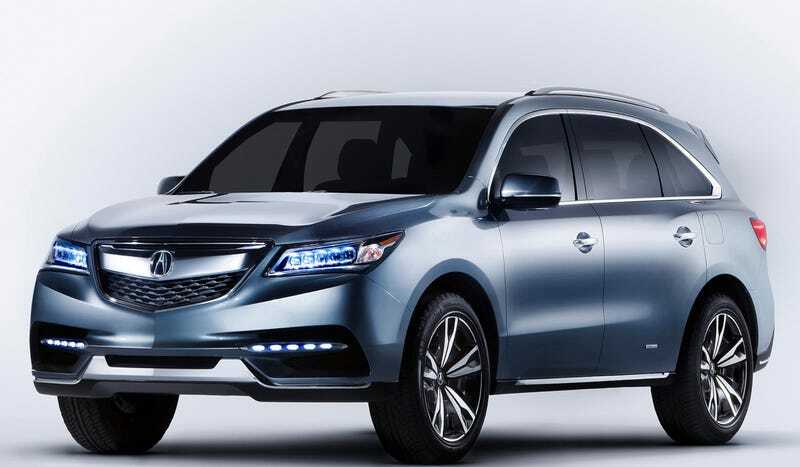 Acura takes a huge risk with showing this prototype as it's impossible for them to create an MDX that looks remotely like this for production. Can you imagine them building it? Their buyers would wonder if they hadn't accidentally teleported to one of H.G. Wells' magical worlds of flying men and movable images beamed into every family's neon hovel. Fortune favors the bold, and I can't imagine fortune smiling on anyone as much as Acura if even 10% this wild, absinthe-fueled dream is built.